[prMac.com] Hagenberg, Austria - October 29, 2007 - Ergonis Software today announced the release of PopChar X 3.3, the popular tool for inserting umlauts and special characters into the text of any application. The new version is ready for Mac OS X 10.5 ("Leopard") and comes with a new magnifier tool that provides an enlarged view of characters to clearly show all subtle glyph details, including their position relative to the baseline. Besides a number of other improvements, the new version also delivers automatic font selection for all components of iWork '08. "As with every time when Apple rolls out a new version of Mac OS X, we know that many of our customers would not upgrade to the new OS without being sure that their favorite font utility works on the new platform," said Christoph Reichenberger, founder and CEO of Ergonis Software. "We are therefore happy to announce the Leopard-ready version of PopChar X today, right after the official release of Mac OS X 10.5." To help people better understand and manage fonts in Leopard, Ergonis Software has teamed up with Take Control Books to bring a special limited-time offer. Every PopChar purchase now includes an exclusive 30%-off coupon for Sharon Zardetto Aker's 216-page 'Take Control of Fonts in Leopard' ebook. 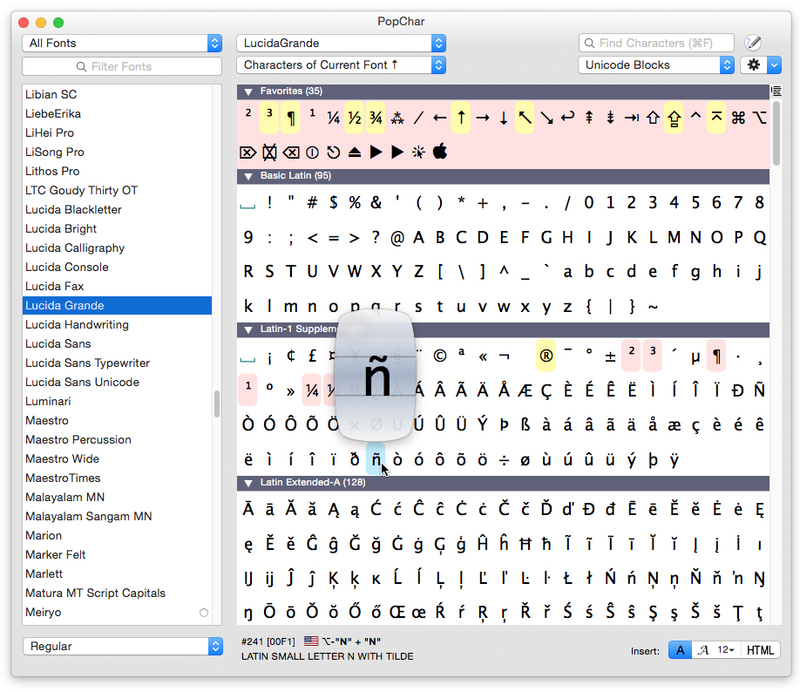 "The new 'Take Control of Fonts in Leopard' explains everything PopChar users need to know about fonts in Mac OS X and what has changed with Leopard," said Adam Engst, Take Control publisher. "In particular, readers will find details on Leopard's new and updated fonts, plus explanation of Leopard's new font activation capabilities, font previewing via Cover Flow, and font sample printing." Visit Ergonis Software's website to learn more about specific enhancements contained in this release and to download a trial copy. PopChar can be purchased securely on the Ergonis Software website. The upgrade to PopChar X 3.3 is free for anyone who purchased PopChar in the last 2 years. For information about purchases, including enterprise licenses, volume discounts, and upgrade pricing offers, visit Ergonis Software's website. Instead of purchasing PopChar by itself, customers can get the Macility Productivity Bundle that also contains two of the company's other productivity tools, Typinator and KeyCue. The pricing of the Productivity Bundle represents a saving of more than 35% over the separate purchase of its components. More information about the Productivity Bundle can be found at http://www.ergonis.com/productivity. PopChar X 3.3 requires Mac OS X 10.3.9 or newer, Mac OS X 10.4 or 10.5 recommended.